There were 11 homes sold in Eastham in January, up 5 from December. The median sale price in January was $370K. There are currently 126 active single family listings in Eastham, with an average list price of $593K and a medium price of $439K. For more details, graphs, and commentary, download my latest monthly Eastham newsletter -- here. 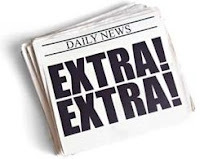 I've been publishing this newsletter for almost 9 years with the goal of providing market information to my clients, so they may approach the market from a more informed position. Check it out! A story that no one expected to actually end has had a sort-a happy ending. 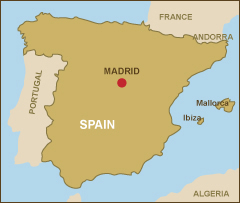 Apparently a boat lost at sea off Nantucket Island during the summer of 2008 has been found off the coast of Spain. That was almost 3 years ago. The 'good' part of this story is that nobody lost their life when the boat 'got away'. Read this story in the Boston Globe's bostom.com website..... Here. This last week or so has seen an unprecedented number of dolphin strandings on the bay beaches of Brewster, Orleans, Eastham, and Wellfleet. So many, it seems, that the national news has picked up the story. Sadly, most of the approximately 85 dolphins expired before the tireless volunteers of IFAW's rescue efforts could save them. They were able to save about 35 animals by transporting them to Provincetown's Race Point, where they released them safely into the open ocean. The following video is from Fox News, broadcast this morning. Check out this article for some background and ideas relative to your ARM evaluation. 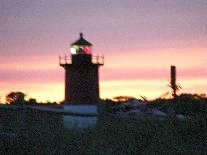 The photo below was taken early this morning by my friend Leslie R. during a walk at Coast Guard Beach in Eastham. I'm fascinated by how the snow comes down to the high tide line. And by how many folks must walk the beach, even on more difficult days. But Outer Cape folks tend to be a 'hardy stock', loving the outdoors. Well, the snow will be short lived. It's supposed to be above freezing on Monday and into the mid-40s on Tuesday. I guess I need to be careful what I ask for (although I really didn't ask for this, see post below) since snow in Eastham isn't out of the question. We're in the middle of a snow storm that's sweeping up the East Coast. The expectation is 7 - 10 inches. 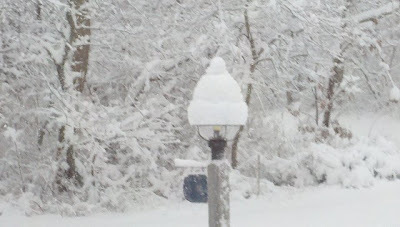 Here is a photo out my front door this afternoon. 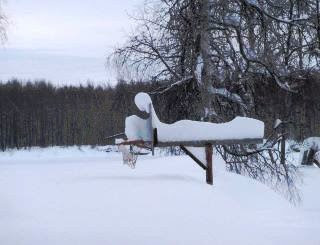 Photo of the Day - You Want Snow? A friend of mine sent me the photo, below. It shows the current snow on the ground at the Kokrine Hills Bible Camp in Alaska. What you see is a basketball hoop (normally 10 ft above ground) with less than 2 feet of 'air'. Thankfully, Eastham, and much of the East Coast, has been spared any appreciable snow so far this winter. An article in today's USA Today gives us hope that the 2012 housing outlook is more positive than we may have thought. In fact, the article points out that many experts feel that we may be at the bottom, but doesn't go as far as saying that we will come off the bottom, price wise, in any big way this year. Check out the "Housing outlook is more upbeat at USATODAY.com. Of particular note, the 2011 statistics for Eastham would strongly lead us to believe that we have bottomed and slightly improved. For my complete year-end report, download my latest newsletter ... Here. My 2011 Year-End Report Is Available Now! My February 2012 report is available now! This issue of my monthly newsletter has my 2011 year-end report, and where I believe we're headed for 2012. 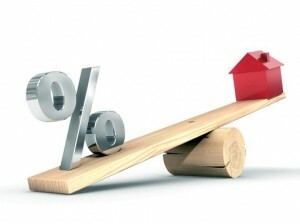 Additionally, you'll find an article about reevaluating your adjustable rate mortgage (ARM). This newsletter has been published every month for almost 9 years. My aim, with my newsletter, is to provide accurate sales and market information about the Eastham housing marketplace, to add commentary and opinion (as appropriate), and to keep it interesting. Download your copy of my February newsletter now. I have a particular interest in the continued 'climb' of the Freedom Tower, known as One World Trade Center, in New York City. 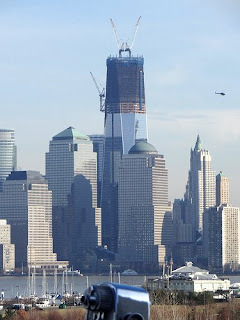 The building is starting to rise significantly above neighboring structures, as seen in the photo, below, taken this past Friday by my son, John, from the New Jersey side of the Hudson. The median sale price in December was $370K. There are currently 111 active single family listings in Eastham, with an average list price of $559K and a medium price of $434K. The average days-on-market is currently 214 days.